On the Configuration app’s Support page, you can review the Browser Logs and Server Logs, as well as edit the logging Settings. The Browser Logs display messages that were logged from users’ browsers. The Server Logs display messages that were logged by the services in the farm. The logging Settings allow you to change how much information you want to be recorded in the logs. 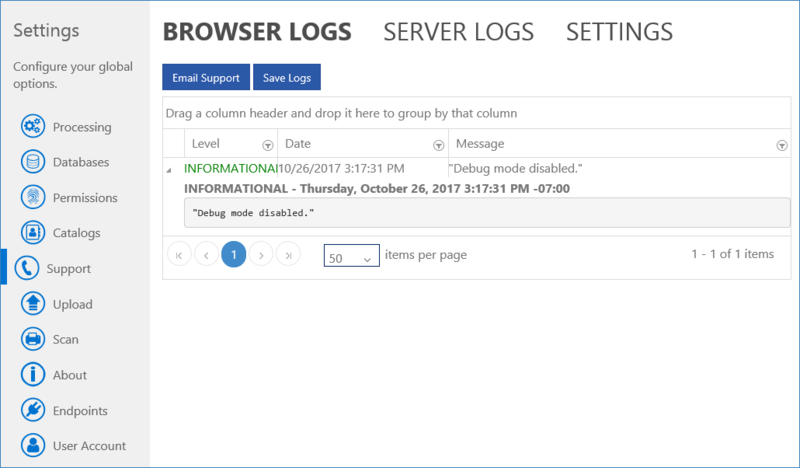 There are 2 types of Logs to look at in the Support Page, Browser Logs and Server Logs. The Browser Logs tab displays all of the messages that have been logged by users’ browsers while they use the Capture Server web applications. In the message list, you can see the messages’ severity level in the Level column, the date and time when the message was logged in the Date column, and the basic details of the message in the Message column. If you expand a row by clicking the Expand button ( ), you can view the full message, which will contain more details. The Support page’s Server Logs tab displays all of the messages that have been logged by the Capture Server services. To view logs for a specific service, select it from the list at the top of the page and then click the Refresh button ( ). In the message list, you can see the messages’ severity level in the Level column, the date and time when the message was logged in the Date column, the portion of the code where the error originated in the Class column, and the basic details of the message in the Message column. Both the Browser and Server Logs will allow you to Sort, Filter, and Group to better locate the items you are looking for. You can also download these logs if they need to be sent to KnowledgeLake Support. The Support page’s Settings tab allows you to change the level of detail that is recorded in the logs. Choose Sparse if you only want to log Warning and Error messages, or choose Verbose if you want to log messages of all levels.